Matt staples hardware cloth (galvanized steel mesh) to the chicken coop. Wow, what a day. I’m really loving how I started out with the delusional thought that we’ll come close to finishing the coop. And then reality kicks in, and we accomplished about half of what we set out to do. 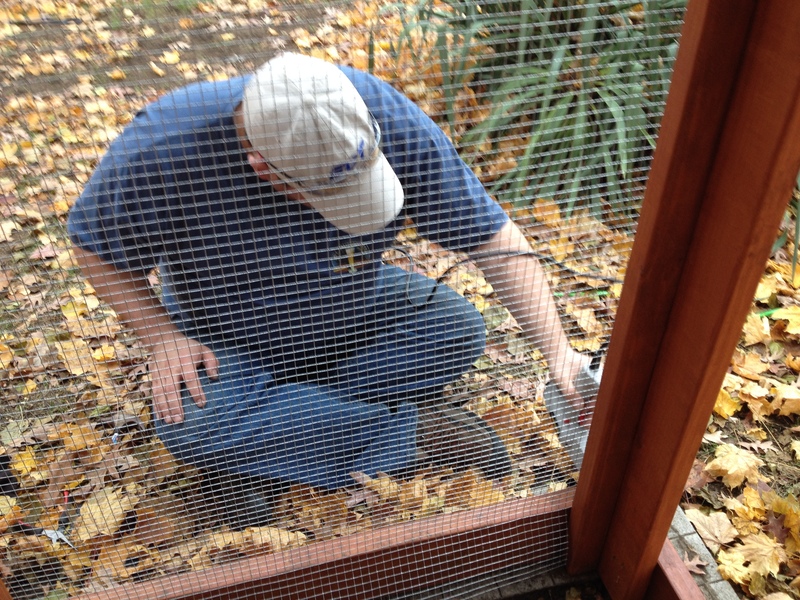 Today, we *almost* finished installing the wire mesh on the chicken coop. It was a lot harder than I thought it would be. I mean, A LOT harder. It took us a while to find our groove, between snipping the wire to length and getting it to lay flat as we stapled it to the 2x4s on the frame. The wire mesh is a beast. An unruly, petulant, thorny beast. Matt sent me into the house at one point to wash the blood off my face. Yes, Blood!!! Now that the daylight ends so early, we had to pack it up after six hours of work. As darkness creeped in, Matt screwed a few tongue-in-groove pieces of wood onto the side of the nesting box. It’s not even close to finished, but the skeletal frame now officially has two sides to it. We still have a ton to do. We have to finish constructing the coop, which includes the back wall, and the side wall that holds the nesting box and a window. We also have to build a door that will enter into the run, and a door (with a window!) that will open into the coop. I still can’t quite figure out how the coop door is going to work, but we have pictures (kind of ) to work from … and a lot of good intentions. That should work, right? So now that it’s totally dark out, we are closing shop for the day. Matt has a poker game with his friends, and I have about three weeks of “Housewives” to catch up on. And this week, I’ll keep my eye on the weather reports for next weekend. I’m pretty sure we’ll finish the coop this time. Really.